Friday's release of the Intergovernmental Panel on Climate Change report didn't provide any huge surprises. The group has firmly been in the camp of belief that humans are contributing to the globe's warming over recent years, with their report this year saying there's a 95 percent probability that we are the primary driver. You can read Friday's release of the report -- it is a technical read. understanding of the climate system." There's no dispute that the world has warmed compared to 100 years ago. For Philadelphia in particular, our average temperature from the 1881-1910 was 54.25 degrees. For the most recent 30 year average period (1981-2010), that average temperature has increased to 55.79 degrees. As we've discussed here over the years, it isn't just us pumping carbon into the atmosphere that has warmed us -- a warmer Atlantic in recent decades (partly due to natural oscillations in the ocean temperature, partly global warming) plus the increased size of Philadelphia's concrete island have contributed to increase those temperatures as well. There's also little dispute that temperatures, in general globally, have flat-lined over the past fifteen years. The IPCC does not look at this as a leveling off of a formerly warming globe, instead of looking at oceanic influences (colder Pacific trend over recent years) combined with natural variability as key reasons for the leveling off in the earth's temperatures. There are a myriad of ways to look at this. 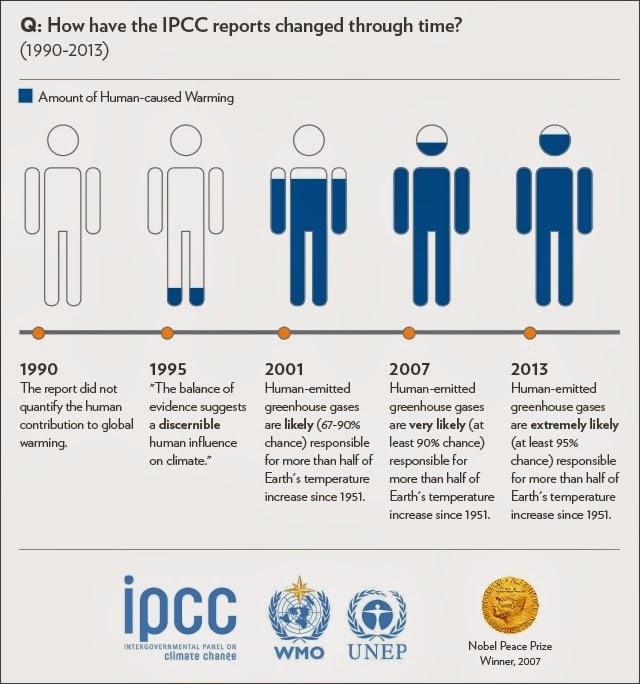 One school of thought is to blast the IPCC folks and scoff at how flawed the climate modeling is of late. To a point, there's a shred of validity and I think merely looking at "natural variability" is not a sufficient enough cause. It could be partly due to the deeper parts of the ocean absorbing some of the heat that apparently isn't getting reflected in air temperatures though there are probably other factors. 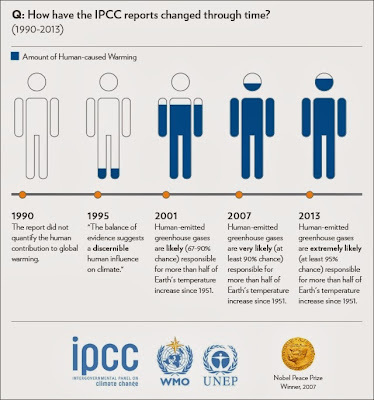 It's also important that the IPCC is not a perfect panel -- the Himalayan glacier comment in their past report is one such erroneous mention that should be noted. There is the "doom and gloom" school of thought, where one meteorologist is contemplating a vasectomy and has sworn off flying as a result of the report. We'll leave you to read and ponder...not much other explanation is necessary other than this -- one man's changes, even if multiplied over a large population, still don't offset corporate contributions to the environment...especially in developing countries, which are increasing their share of carbon output and have higher rates of carbon contribution per unit of GDP than the US. 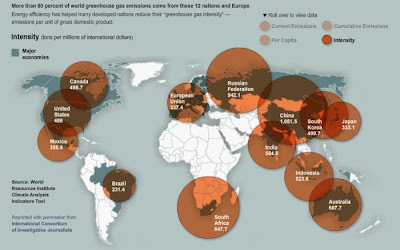 This isn't to say the Americans are choir boys in this department -- we still contribute more than our fair share -- but carbon contribution is a global issue. Emissions per unit of GDP. The US ranks below some other developing economies globally in this category. My reaction goes in between both extremes. One, numbers don't lie. It's a warmer world than it used to be, with wackier weather overall. Climate is an ever-evolving process -- the world's climate has consistently, constantly changed and it's important to point that out. We have had warmer periods, ice ages, and everything in between. There is no normal. That said, man is probably throwing logs and perhaps even napalm on the evolving climate's warming fires. This isn't a man is evil, we screwed ourselves, and we're doomed type post but with the recent fluky nature of our climate I do think we're probably contributing *some* level of change. What that level of some is can be debated and researched. I also think it is ok to be skeptical of the level of man-made contribution to changing climate. Our contribution is a very likely part of this mix but I do think given the pause in warming over the last decade and a half there is still more research and study into the impacts of other drivers on climate that is needed and I wish the IPCC would have been more willing to note this pause *may* be a part of a longer-term trend that establishes itself, even beyond the end of a cool Pacific cycle. It is clear that climate modeling has failed to catch this temperature trend but whether the 15 year pause is a mere blip, a part of a slower climb, or even something in between, remains to be seen. To say that man is the primary or even the sole driver of changing climate perhaps gives ourselves a lot more credit than we may deserve and perhaps is a bit haughty. Being skeptical of the level of contribution we make while acknowledging there is at least some contribution is not a denier viewpoint, nor should it be. Should we be good stewards of the world we have? Absolutely...if not for others, for your kids and grandkids. Should we find a way off of oil and find a new energy source? Absolutely, and not just for carbon contribution reasons...there are those pesky geopolitical ones as well (there are other places to discuss that). That said, with everything there is balance. I don't see the world at some "tipping point" where we're going to die if we don't take action yesterday. I also don't believe there is a "normal" that will continue to exist as is, without change, going forward. Our world and its climate will be different than the one that exists 50 to 100 years down the line, even if man had no influence on climate whatsoever. I also don't think the world is cooling and that the world is prone to an ice age soon. Should we be able to react, manage, and adapt to those changes and others that are unforeseen to come? Absolutely and I think more work, time, and research need to be spent on adaptation...such work has already taken place in a number of places. What is refreshing is that the IPCC neglected to issue a "best guess" forecast for the coming years, leaving a range that generally is between 1.5 degrees and 4.5 degrees Celsius for a potential temperature rise over the next century. The last prior report, issued in 2007, did include a "most likely" figure. If anything, it does show that the scientists that worked on this project that there is uncertainty about what they think the extent of warming will be, even if they all agree that warming will continue. The preceding post is opinion and not necessarily reflective of the staff of Phillyweather.net.